Excellent Sterling silver top claret jug with Boars tusk handle and star cut to the base of the glass body; by Hukin and Heath. Silver mounts and top hallmarked London, 1898 and stamped with the registered design number. Dimensions: 12.5 cm/4 inches (diameter) x 18.5 cm/7¼ inches (height) Bentleys are Members of LAPADA, the London and Provincial Antique Dealers Association. All prices are net of VAT for export outside the EU. 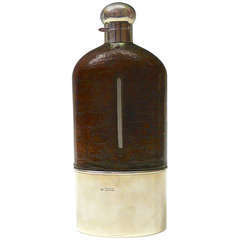 Large sterling mounted cut-glass claret jug, with hinged top, on a cylinder cut-glass diamond pattern handled jug. Measures: Standing 12.5" high, 6" wide to the handle. Stamped .925. Antique English Cut Crystal and Sterling Silver Claret Jug by Elkington & Co.